I have a book of Audrey Hepburn. Plain white cover, text in Italian and English, discreetly marked by the Museo Salvatore Ferragamo. It's one of the prize books in my library. Not for anything in it that's profound, and not for its significance to other aspects in my life, nor for any sentimental reasons or memories or connotations to moments in time. I just like it, that's all. Its simplicity, its elegance, the feel of the pages underneath my fingers, the smell of the paper curving into the binding. I like its text, that lays out the course of a life in simultaneous languages, reflecting the reach and fame and universal appeal of its subject. Most of all, though, I like its pictures. The pictures lie in patterns intertwined with the text so that each takes turns pre-occupying the viewer and each other. But the pictures, unlike the text, flow with a power of imagery and vividness of life, becoming more than the mere chronicle posed by words to instead bring the proof of the visual, and the immediacy of truth that rings in the realization that they reflect moments in time that were real and not just momentary fragments of a lost imagination. I find myself in quiet moments occasionally drifting through its pages. Just looking at the pictures, and seeing how they show the course of her life from her first moments in the public eye to her last days campaigning around the world. My mother first introduced me to her at some time in my childhood, remarking on her work with UNICEF and how she had somehow managed to grow so gracefully with age. I think my mother mentioned something about how she wished she could do the same. I remember, once, my mother pointing out the cover of Vogue, with Audrey Hepburn, then in her 70s, posed next to a very young and very well dressed and very made up anonymous fashion model still very much likely just reaching her 20s. My mother commented how remarkable it was that Audrey Hepburn still dominated the picture, even as old as she was and in stark contrast to the young woman next to her. She was right: the model was very pretty; Audrey Hepburn was very much more. I'm somewhat partial to the young Audrey Hepburn. The Roman Holiday-Love in the Afternoon-Funny Face Audrey Hepburn, face fresh and eyes open, new to the world with the enthusiastic energy of youth and the carefree curiousity of the unknown. You can see it in the pictures: the sense of anticipation and excitement of a mind eager to venture forth, uncowed by any sense of trepidation or fear. Her images speak of a time not knowing an understanding of the world. A life that saw the world as full of possibilities. Those times, of course, didn't last. She matured past the ingenue. She became the Breakfast at Tiffany's and Wait Untill Dark and Robin and Marian Audrey Hepburn. The woman who became married and divorced and married again. The mother who struggled to have children. The adult who was mobbed by paparazzi and was regularly featured on magazine covers. The celebrity caught by fame and scandal and rumors and who struggled with the vices of anorexia and nicotine. The mature Audrey. The sophisticate. The pictures show as much. They show a face drawn increasingly wan by the exposure to the elements of life, shaded eyes filled in by the experiences of passing years. They tell of a life that was being lived within the world enforcing limited possibilities, and which struggled to find an understanding to make something of it. 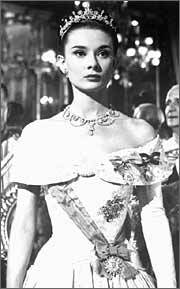 The most intriguing pictures to me, however, are the ones of the aged Audrey Hepburn. The one past the days of film. The one who left the public eye. The one who left her former life as Hollywood star and became a representative for UNICEF, traveling the world to advance a cause on behalf of children impoverished and abused. The pictures of her then reflect a very changed person. The face is drawn, but out of the richness of experience. The eyes are filled with years, but glow unhooded in the serenity of time. The images present a life that had reached an understanding of the world, and an acceptance for what it was and the wisdom to know what could be changed. What is most interesting in the pictures from this time is the return to the vigor of youth. The spirit in the eyes, the twinkle in the smile, the radiance in the face. They all return the visage of her when she was young, with the freshness of a mind that could see the world in light once again, and as a place of so many things to see and so many things as possible. In these pictures, she became herself once again...the person she once was and always had been. I think of Audrey Hepburn sometimes in a race. Not her, specifically. But her pictures. They strike me in how they bring together the whole of a life within the briefest handful of pages. It always fascinates me how in summary, all of a person's life can be seen in a single arc made simple, following clearly the stages from childhood to maturity to old age. All of life in a microcosm made perceivable by the comprehension of a single span. It's so much like a race, which is in itself its own microcosm of life and living. We begin the day in the early morning darkness, and take off from the starting line in the giddy enthusiasm and excitement of spirits eager to venture into the unknown, faces alight in the energy of minds filled with curiousity, eyes open to the limitless possibilities of the rising dawn. The world is open to impossibilities, and it is whatever we can imagine of it. Then, once on the bike, we face the assault of reality by the elements of life that come at us as wind and rain and heat and dust and hills and sun, and which temper our aspirations into the confines of a world through which we struggle to make our way, faces made wan and eyes filled with the experience of passing miles. It is during this time that our perception changes, and our understanding is of a world limited by possibilities immutable to our efforts to make something of it. But somehow we make our way to the last stage of the run, and find ourselves at the end of the day alone with our past, shuffling with our memories and our thoughts steeped in the hours we have lived. We lose ourselves, identities lost to the miles, and gradually all we are is distilled in the progression of the distance that filters our spirits through the realization of understanding and the serenity of time, until we are empty of everything except for that which we truly are and always were. And then, in the wisdom acquired by eternity, we near the finish and come to know what it is we truly are: alive, and vibrant, and fresh, and able to understand the world so as to see the it in light despite itself. A world of so many things to see and so many things as possible. It's funny. We journey so far only to bring ourselves back to the beginning. We learn so much, live through so many things, only to return to the truths we had when we first started. The only difference is the experience of the distances over which we have travelled, and the enlightenment it brings and the grace it offers in knowing the value of the qualities we had as children, when we accepted life and the universe about us. I remember my mother, looking at the cover of Vogue, told me she was amazed at how Audrey Hepburn looked the way she did in her old age. My mother said "She was remarkable, yes?" Looking at the picture, I disagreed. "No," I said, "She was beautiful."